Hello! Just a quick little post with a snapshot of yesterday’s outfit. I met up with a friend for curry, strawberry and mascarpone tart and a hot chocolate that resembled pure syrup. All in the good name of testing new food places out, yup. Onto the outfit, I’ve got right back into wearing my Chloe boots again, now that the weather is less rainy as I’m always so scared I’ll damage them if it’s anything other than dry or sunny outside. 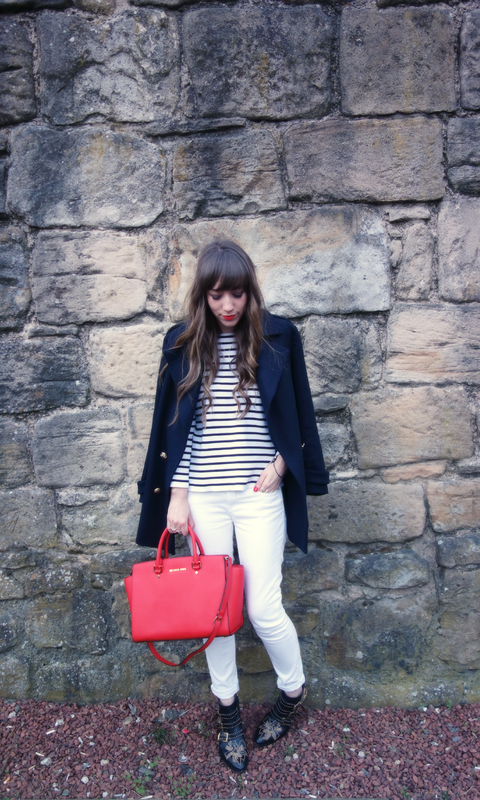 This Zara coat has been seeing the light of day recently too, as navy and stripes were born to be together. Today I’m off to a little blogger meet up in Newcastle as there aren’t enough up North! It’s nothing too formal, just going for food etc so I’m looking forward to it. It’s always nice to see and meet bloggers in your local area! Also, thank you for the feedback on my Creme Egg Brownie post, I’ll be including more baking posts in the future I think as I quite enjoyed putting it together and you all seemed to like it! Aaand finally, there’s quite a few things gone out of my blog sale so be sure to check it out before it disappears at the end of the month!